The summer temperatures of South Korean seas are found to have risen nearly three degrees Celsius from eight years ago due to global warming. The Korea Meteorological Administration(KMA) said Thursday that based on its measurement using maritime observation equipment, sea water temperatures in the summer have been sharply rising since 2010. 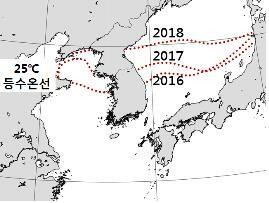 According to the analysis, the average temperature of all seas surrounding the Korean Peninsula including the east, west and southern oceans has risen about zero-point-34 degrees each year since 2010 for the month of July. The average temperature recorded 21-point-36 degrees in July 2010 but climbed to 24-point-25 degrees this year. The KMA warned that along with the rising water temperatures, the summer heat wave may become more severe each year.